Long regarded as one of the worst films ever made, Night of the Lepus finally makes its way to Blu-ray courtesy of Scream Factory. Plot: Giant mutant rabbits terrorize the south-west. An overpopulation of rabbits is forcing rancher Cole Hillman (Rory Calhoun) to take drastic measures to save his farm, but does not want to use any kind of pesticide in fear of harming his cattle. He consults with college president Elgin Clark (DeForest Kelley), who seeks the assistance of Roy and Gerry Bennett (Stuart Whitman & Janet Leigh), who have been researching more natural ways to eliminate or control pests. In their lab, under controlled conditions, they inject one of the rabbits with a serum to see what effect it has on the species. Unfortunately, their daughter, Amanda (Melanie Fullerton), releases that same rabbit onto Hillman’s ranch without her parents’ knowledge. The result is an infestation of enormous killer rabbits attacking the community. After the surprise box office success of the killer rat movie Willard in 1971, Hollywood studios were scrambling to come up with more horror films involving small animals. 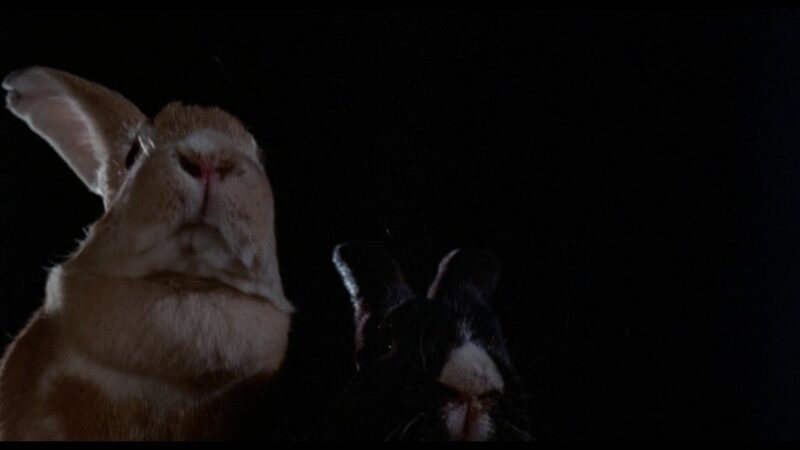 MGM’s foray into this sub-genre was 1972’s Night of the Lepus, based very loosely on the satirical novel The Year of the Angry Rabbit by Russell Braddon. I say very loosely based because the location is shifted from Australia to the desert ranchlands outside of Tucson, Arizona, the movie only uses the main plot point from the novel, and the movie takes itself seriously. Night of the Lepus also doesn’t have the look or feel of a horror film, likely due to the hiring of producer A.C. Lyles and director William F. Claxton, both better known for westerns, which this film resembles. The film never builds up enough tension to be even remotely frightening, and the effects, although considered quite good at the time of its release, are extremely laughable by today’s standards. Is Night of the Lepus one of the worst movies ever made? Not exactly, as I can name several others more worthy of that title. Per Scream Factory’s liner notes, the transfer used to create this Blu-ray release came from a new 2K scan of the interpositive, and it looks quite remarkable. Retaining the film’s intended theatrical aspect ratio of 1.85:1, the movie has a definite early 1970s look, with a color palette leaning towards earth tones that are bold and vivid. Detail is very good, revealing textures in fur and fabrics. Contrast is also exceptional, with deep blacks that never appear to crush and bright whites that don’t clip (especially during the scenes inside the Bennett’s sterile white laboratory). Film grain is noticeable and natural, although more apparent in optical shots and the use of stock footage. Scream Factory’s release of Night of the Lepus features a nice DTS-HD Master Audio 2.0 mono soundtrack that delivers the goods and nothing more. Fidelity is very good, with clear and understandable dialogue and well-layered sound effects for a dated mono track. Audio Commentary with Author Lee Gambin: Gambin has written several books and articles on this genre, and has lots to say about the history of this film and how dearly he holds it in his heart. It’s a good listen, but sometimes Gambin is too enthusiastic and speaks a mile a minute. Audio Commentary with Pop Culture Historian Russell Dyball: This one is bit more low-key, as Dyball takes his time doling out trivia often layered with puns about the history of the film. Theatrical Trailer (1080i; 1:45): Taken from a 35mm source. Television Spot (1080p; 0:22): Taken from a 16mm dupe (trailers were sent to TV stations on 16mm back in the old days). Radio Spot (1080p; 0:34): The artwork used here is just bizarre. Image Gallery (1080p; 4:46): A slide show of production stills, movie posters, lobby cards, and newspaper ads. I just wish each one had a chapter stop or that I could more easily thumb through these individually rather than have to scan through them. 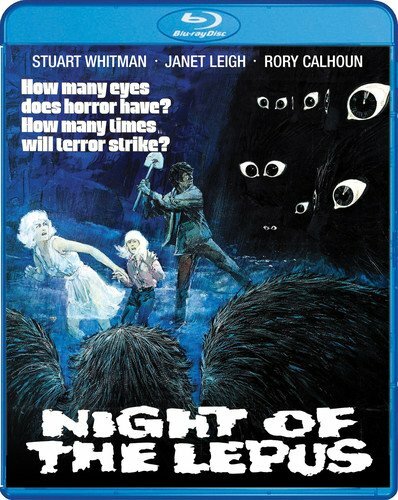 Scream Factory does what they do best, bringing a cult-favorite like Night of the Lepus to Blu-ray with a nice transfer and engaging commentary tracks. Indeed one of the worst films ever made but everyone who watches it loves it and the bluray release is excellent in picture and sound……..
Next Next post: What is your favorite commentary?